One of the most influential bass players for me, anyway. Annnnnd… he plays a Stingray! You can see it in between the shaky blurry shots of guitar players and crowd heads in this video… and hear one of my favorite bass lines. My Yamaha TRBX304. 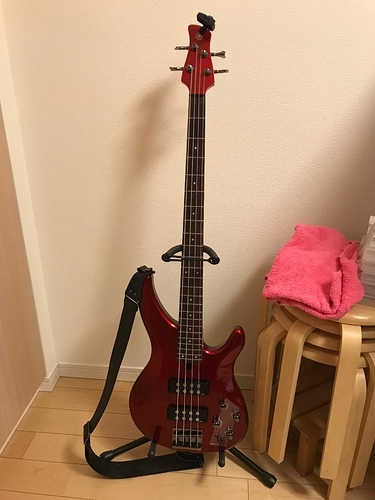 It was a really hard purchase decision between this and a BB234 - the bass I used to play way back in college was my roommate’s BB, and man I loved that thing. I never did any real lessons back then - just kind of figured it out, since he was the actual bassist and I just played it for fun. Regretting that now, glad to find such a great beginner’s course to get back in to it, years later. No regrets, loving the TRBX, it even came set up reasonably well out of the box. Plus I fell in love with the candy apple red, which we all know is the most important factor when choosing a musical instrument. @howard Very nice guitar, and welcome to the forums! You have good taste in guitar stands, too! Ha! 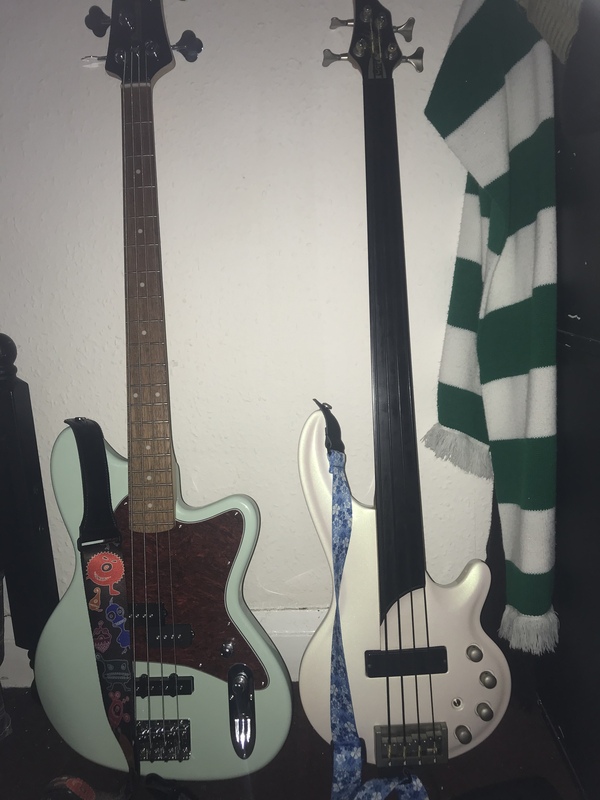 First 3 basses I bought were 100% looks. Luckily the 3rd one was also a good bass. I want those wall hangers! Hi all! First and foremost, Josh I am LOVING the program! Figured I’d join in this cool thread and show my two beloved Fenders. 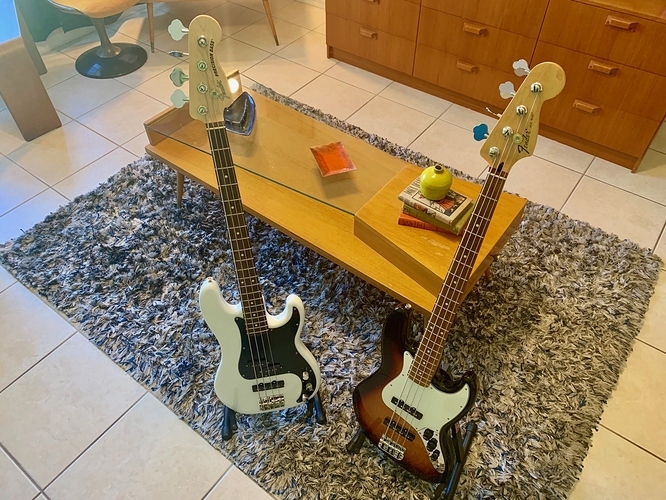 Jazz is a 2017 Fender MIM, and the P Bass is a new Fender USA Performer series (Somewhat of a P/J with the one Jazz pickup, it sounds amazing). Cool basses - also, dig the decor. Very hip. What Gio said, nice basses and sweet home decorating! Glad you’re digging the course. @rgroxx Very nice guitars . . . and welcome to the forums! In the picture is my Peavey Raptor guitar. The Jass is a DIY kit from Amoon. A little history, Im 71 years old going through my third child-hood, according to my wife. Played in many bands back in San Francisco from 1965 thru 1975. Marriage, kids, and working full-time as a plumber in SF didn’t give me much time to play. I turned 70 and for my birthday I got the Raptor with a Peavey VIP amp. Its been down hill from there. Played in many bands back in San Francisco from 1965 thru 1975. Good for you and welcome back Your guitars look great, too! Awesome. How’s it going, neighbor? I’m up in Petaluma. What kind of bands? Band names?? I’d love to hear more about this! Just found this website, while looking for a decent amp. I’ve been playing for about 5 months, and flipping loved every second of it. and then I saw the Cort Curbow-4FL. @jones . . . That Cort fretless looks awesome! it’s really pretty, in certain light it’s two tone paint so it shimmers green, it’s really smooth to play once I got over sliding up and down the fretboard! Doing the old WIT WOO! Haha! I have a Fender Rumble 15 but it really struggles when messing with the pots on the amp, possibly because it’s only 15w sounds fabulous clean though. I should perhaps think about getting something a touch more substantial.